America awoke to a sobering reality on Nov. 9, 2016: Donald Trump has been named the president elect of the United States of America. It's easy to feel like screaming and crying and questioning why the country that is supposed to be about love and acceptance has so blatantly chosen hate — and if this is the case, please know that your feelings are valid. Also please know that now is the time for us to band together to make our voices heard, and once and for all prove that love really does trump hate — after all, as Michelle Obama said in a July speech, "When they go low, we go high." One of the questions many may be asking in the fact of the election night decision is how this could all change. When will the glass ceiling be shattered, and how? After Hillary Clinton promised in her concession speech on Nov. 9 that it would happen, one day, I personally found myself wondering if it would eventually be by a member of the Clinton family; like, say, Clinton's daughter? Would Chelsea Clinton ever run for office? She does, after all, have a lot of experience on the campaign trail. It's not clear as of now if the daughter of former president Bill Clinton and former Secretary of State Hillary Clinton would ever consider a run for presidency — however, as a Jan. 2016 article in the New York Daily News reported, it's been rumored before. "You’re seeing the beginning of Chelsea Clinton preparing to run," a donor reportedly told the NYDN in January, "A dynasty is on the way." 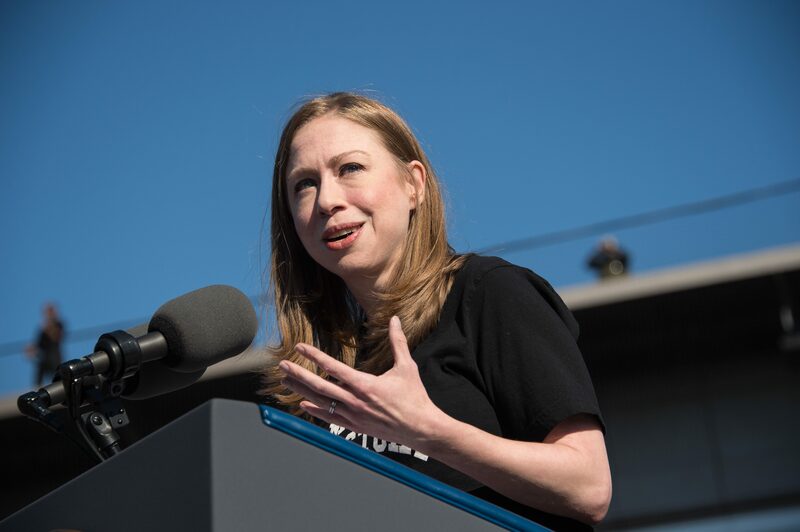 Chelsea herself has never commented on the possibility of running for POTUS, but considering she spent much of her childhood living in the White House, and much of her adult life in politics thanks to her parents' positions, I could definitely see it happening. It would just come down to whether or not she would actually be interested in running. In March 2015, she reportedly told Sky News that she would "absolutely" consider politics — so, maybe there's a chance? It's a small hope to hold on to in the face of this very devastating news, but it's important to continue to hold on to it. We will prevail if we move forward and keep fighting for the good in the world.